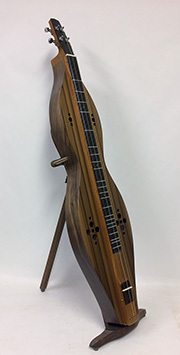 We offer three styles of the Blue Lion bass dulcimer  the Bass (BD), the Baritone (BarD) and the 6 string Bass (BD6). Our bass dulcimer was designed with the ensemble player in mind, and indeed the bass has proven itself in group situations as well as a lead solo instrument. The bass is tuned an octave lower than the standard dulcimer; all standard dulcimer tab may be played on the bass as the bass uses the same tunings. The six string bass is set up with three courses of doubled octave strings and sounds very much like the dulcimer-equivalent of a twelve string guitar. The baritone is usually tuned a fourth lower (AEAA), which puts it in the key of A; it can be capoed in the 3rd fret to play in the key of D, or can be retuned to reverse Ionian ADAA to play in the key of D.
All three models come standard with walnut back and sides. Depth of body: 2 3/8"
Width of fingerboard: 1 1/2"